Are you using Points or Points and Sprites as your star style? Why couldn't that terra have an atmosphere that thick? Venus's atmosphere is actually twice as thick as the one in the screenshot, so I don't see an issue with that world. The ones with hundreds or thousands of atmospheres I find somewhat unrealistic, then again, we simply don't know the range that would be typical in nature. Sometimes the star browser will bug out and not include the multiplicity, planets, and 'with life' data for some stars. Seems to happen after doing it a whole bunch of times or doing a search radius of 100 and there are a thousand it detects. 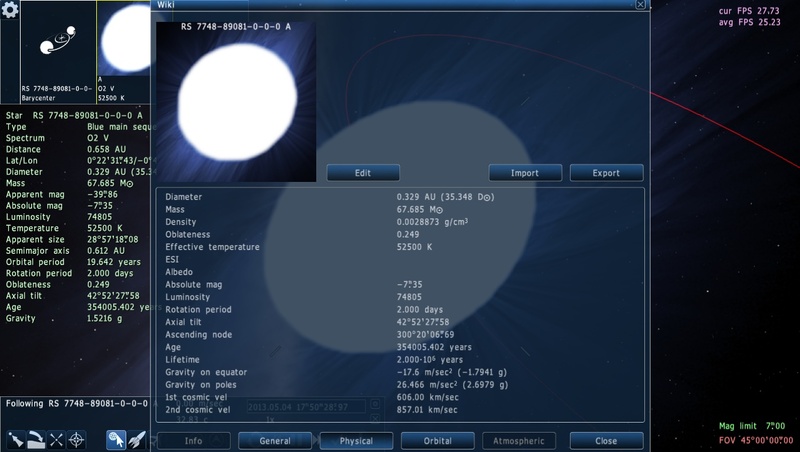 I found a star that is spinning so fast that it has negative G's at the equator. It should be torn apart because of this. Ran into another example of this bug, not quite as extreme as the one donatelo found. Also, not sure if it's me or if very oblate stars always have a rotation of two days? In an OB type star pair, both stars had rotations of exactly two days, which seems a bit odd, and no they weren't close orbiting binaries. Oh, me being tired then I guess. 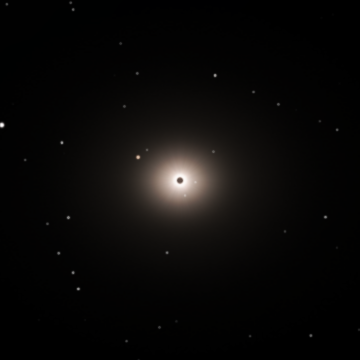 Edit: I may be tired, but I'm pretty sure this galaxy isn't supposed to look this colorless. It also looks exactly like a procedural galaxy that I saw which looked the same way. Clearing cache doesn't do anything. 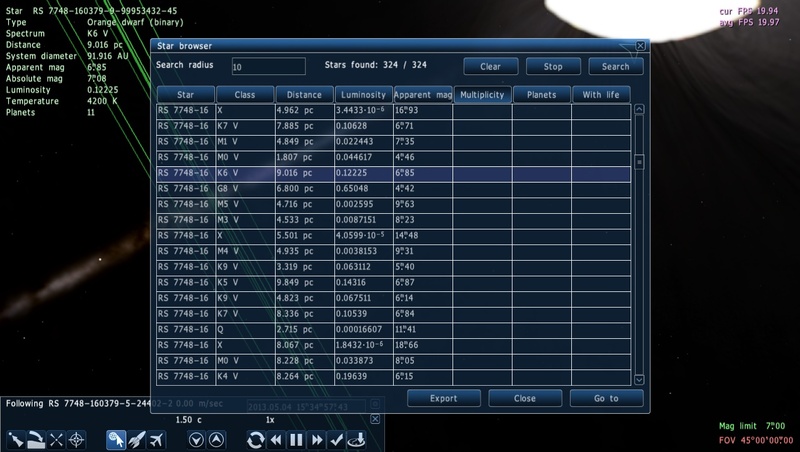 Btw, this is one of the galaxies listed in the models text file. The first time it happened, I thought it was the program glitching out because there was another galaxy that looked ghostly, but was fine after a restart, looks like it's not glitching out this time and it actually is being rendered as almost colorless. Howdy, everyone. 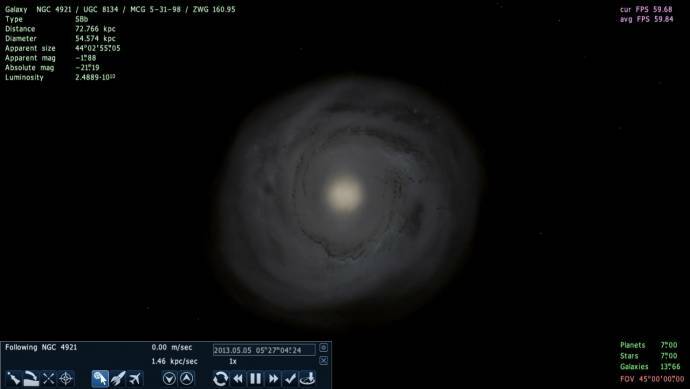 Been following Space Engine for a little over a year now, and I thought now would be as good as ever to make an account to report 2 bugs I found. 1. The terrain engine, while generating snow caps for mountains, completely ignores planetary temperature. 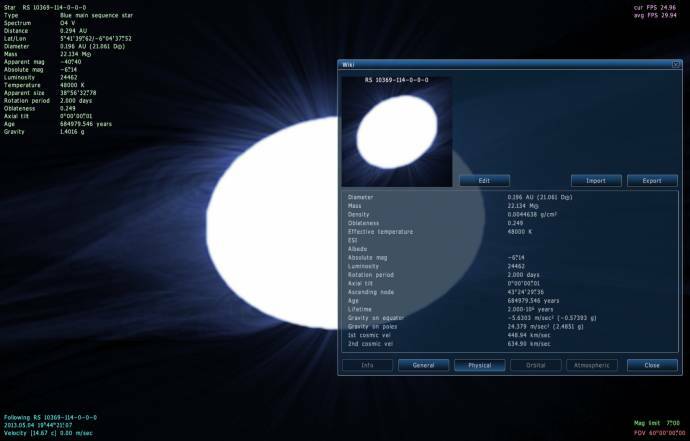 For example, this image was taken on a hot desert within .97's default system. 2. There appears to be a SEVERE problem with comet trail rendering. Every time I go to render a comet with a trail, my computer is brought to its knees. Here is my system while not rendering a comet trail. Here is my system while rendering a comet trail. Note: this is a non-issue when rendering non-trailing cold asteroids. It seems to only happen when the comet has a trail. Here's my driver info in case it is necessary. Hope this is all helpful! Habit, welcome to the forum. The increased system load when rendering a comet tail is pretty normal, and snowcaps on hot worlds aren't necessarily a "bug", just a shortcoming in the terrain generation code which will probably be refined in the future. Just thought I'd make note that the grey shaded gas giant glitch is still around, though not common. Actually, if you remove the atmosphere, you can see that it is actually a light blue color. What glitch? I don't see anything wrong. 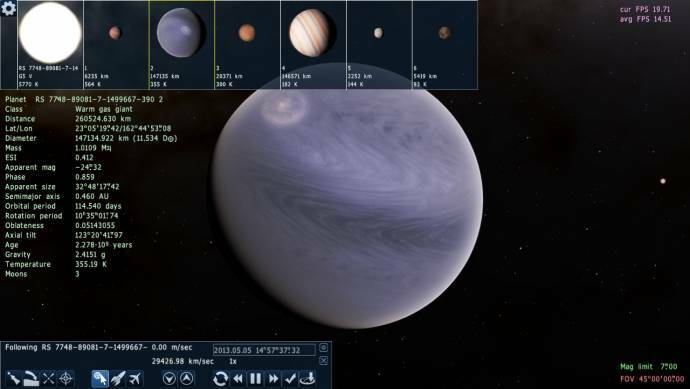 You know how sometimes in DoctorofSpace's gas giant palette addon for 0.96 there would be the occasional gas giant which looks colorless? That's what I mean. They aren't common anyway. there would be the occasional gas giant which looks colorless?